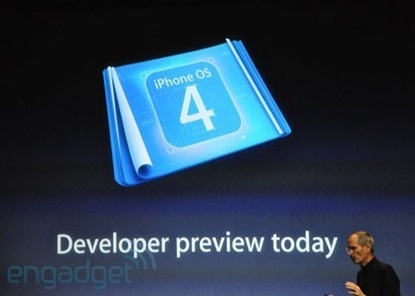 Apple iPhone OS 4.0 announced today at special event is available for download to developers only. Those users having Apple developers account can download iPhone 4 firmware for iPhone 3G, 3GS & iPod Touch 2G & 3G. Whereas normal users will only get their hands on iPhone OS 4.0 in summer 2010. With heck lot of new features it’s obvious that iPhone users can’t hold their patients so long and must be looking for some way to grab iPhone 4 dev preview build. Guess what iPhone OS 4.0 Beta dev preview is leaked on iModZone form and available for download for iPod Touch 3G, 2G and iPhone 3GS and 3G those interested users can download iPhone 4 firmware using below link. Please keep in mind in order to load iPhone 4 firmware on your iPhone and iPod Touch you must register your Device id with a Dev Account. You must know the risk involved in using leaked firmware also you will not be able to download to lower firmware once you install iPhone 4.0. You may lose your jailbreak forever(via ithinkdiff).